Mathematics is a tool which is helpful to even ordinary minds to solve complicated problems expeditiously. Applied Analysis and Mathematical Modelling play a vital role in Mathematics as for as applications are concerned. In the past decades, many new concepts, techniques and algorithms have emerged frequently with lot of real life applications. Almost all industrialists, scientists and engineers in various disciplines are applying the computing techniques and mathematical modelling to increase their potential in new ways of problem solving. The International Conference on Applied Analysis, Mathematical Modelling and Computing Techniques (ICAAMMCT—2018) was organized by the Department of Mathematics, The Gandhigram Rural Institute (GRI), Gandhigram, Tamil Nadu, INDIA during March 15–17, 2018. The conference received significant contributions from researchers around the world from all major fields of applied analysis, mathematical modelling and computing techniques. It was a prestigious event organized with a motivation to provide an excellent international platform for the leading academicians, researchers, industrial participants and budding students around the world to share their research findings with the global experts. The conference was financially supported by various funding sources of Government of India such as UGC, DST-SERB, CSIR, NBHM and INSA. The conference facilitated the key tools to young researchers to carry out innovation towards real life applications of Applied Analysis, Mathematical Modeling and its solutions to both old and new computational problems. One hundred and thirty research papers were submitted for presentation in the ICAAMMCT—2018 held at GRI. 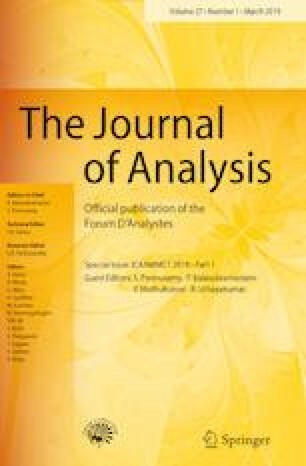 After peer reviewed process, 41 papers are accepted for publication in the Special Issue S.I: ICAAMMCT 2018 in The Journal of Analysis, Springer. The accepted articles are published in two issues. The Department of Mathematics expresses its sincere thanks and regards for all the help and assistance towards this publication received from The Journal of Analysis and from various organizations, institutions and individuals.